Let the battle of the over-actors commence! The only thing that really needs a transplant in order to enjoy Face/Off more completely is a brain, preferably with that of a goldfish (for people who enjoy Transformers that procedure seems to have been successful). 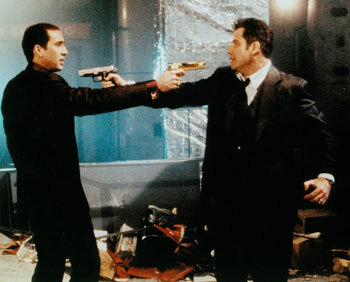 When evil and vicious criminal Castor Troy (Nicolas Cage… initially) inadvertently kills Sean Archer’s (John Travolta… at first) kid in a botched hit, then Archer nearly jails Castor’s brother Pollix… and nearly kills Castor in the bloody operation to nab him, it is fair to assume that the two would never be good buddies. But upon learning that a bomb has been planted somewhere in Los Angeles and is prepped to blow in coming days more desperate action is required. It is agreed that Archer needs to uncover the location and details of the bomb from imprisoned Pollix. To do this he must appear to be a friendly face, and whose face be more friendly than brother Castor?!? To that point Castor’s body was kept on ice, for what reason who knows? In any case a five minute operation peels off Castor’s face and has it plopped onto Archer’s (his is peeled and kept to one side for replacing later). Seriously that’s how they did it! Cut around the edges and peel the thing off. No scars, nothing… if this technology was available over a decade ago how come Heidi Montag and Tara Reid look like scarecrows made out of sacks? Into prison goes Archer to see “brother” Pollix, in an operation so secret that not even his wife can know… Ummmmm, why? Is she such a security risk? But…. while Archer is away and using his face Castor awakes in what you would think is a maximum security area – but no. Within a short time he has rounded up everyone who knows (HOW?) and killed them in one fell swoop. Then assuming no-one else knows out the door he goes to inhabit the life of one Sean Archer, including his job, home and marital bed. Of course now that everyone who knows the deal are dead bar Archer and Castor, so Castor is outside playing cops and hubbies, while Archer is in a maximum security prison with no means of escape. Again ummmmm: Might I propose a hypothetical… Archer tells the true story, and when no-one believes suggests maybe fingerprints, blood types etc? And people who have known either guy for years never twig??? Nope? OK so in escaping dozens of wardens and security members are killed, followed by Travolta and Cage overacting at least 175% MORE than they already do – and they’re both huuuuge over-actors – and leaping around Los Angeles blazing away with two pistols and automatic weapons for about an hour, gunning down perhaps hundreds of innocent cops and bystanders and hitting everyone is sight – but strangely they never manage to hit each other even from point blank range. The film is a little overlong and suffers from being overly sentimental and clumsily emotional and symbolic… we get it, Travolta loves his family and misses his kid, we shouldn’t need to be reminded of it every 12 seconds. So why a pretty generous 7.5? Easy, John Woo knows his action, and even though the film is a half an hour too long another half hour is spent in various shootouts and chase scenes, including a frankly ludicrous but nonetheless entertaining finale with an 8 gun (!) Mexican stand-off, speedboats and a harpoon gun fight that makes the film worth watching by itself. Again this film falls into the “Really?” category of entertaining disbelief with Con Air, The Rock and Bad Boys. Is it odd that Nic Cage is in three of those named, all within 2 years? 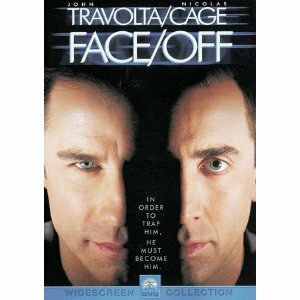 If you go Brain / Out, you’ll enjoy Face / Off. This entry was posted in Film, Movie Reviews, Nic / Nicolas Cage, OGR Recommends, Worthwhile Movies. Bookmark the permalink.